Just like the job changes we track, I've had my own changes to announce! Inlistio is out and TrackJobChanges is in. Why? Well, it's part of a broader strategy with the other companies I've been developing, most significantly FindEmails (formerly known as Toofr). I write about the bigger picture in detail in this Medium post. The reason specifically for changing the Inlistio name is, well, it's just not that descriptive and kind of like Toofr, it's not easy to spell or share by word of mouth. FindEmails and TrackJobChanges are very easy to remember. I also like to do things in pairs (if it's not clear based on my "parallel entrepreneurship" strategy) so I figured if I was going to change Toofr to FindEmails I might as well do the same for Inlistio. TrackJobChanges was the first domain I checked and I thought it was an omen that it was available. And suddenly TrackJobChanges works just like Inlistio. You can log in, create an account, etc etc. If you never new Inlistio existed then there's nothing I need to do. Unfortunately, the web never forgets, so I do have to do something about all those Inlistio links. I want to eventually tell Google to stop indexing Inlistio and transfer the SEO over to TrackJobChanges. 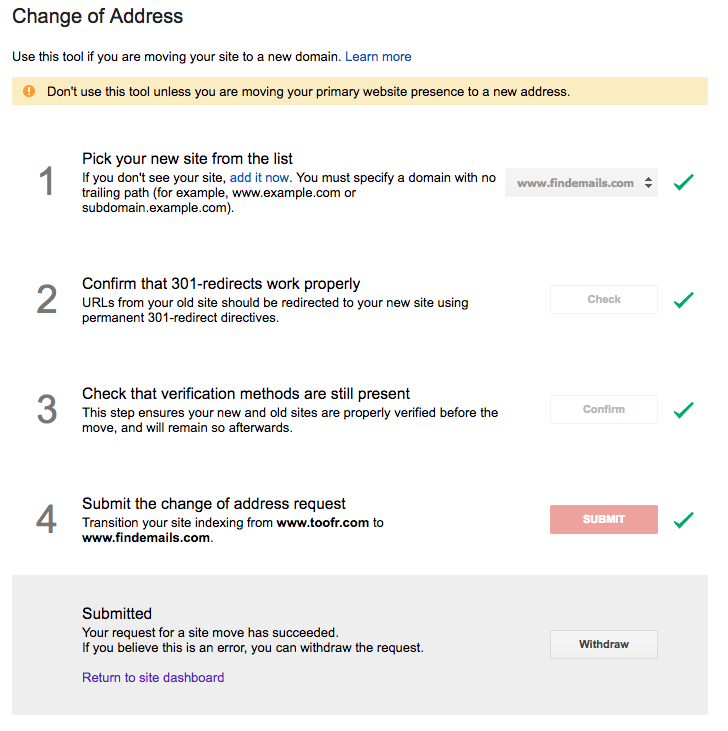 For that I need to use the Change Address Form in Google Webmaster tools. I haven't done this for Inlistio.com yet but here's how it looks for Toofr.com. Getting those 301s in place was the hardest part. I learned that you can't do it at the DNS level. GoDaddy won't let you forward an https domain to another https domain (but http worked fine!). So I did what a hacker would do. I built a standalone Rails app to do the https redirect for me. Here's the code to build a simple Rails 5 api-only app that does a 301 redirect, perserving the path, so any GET request to https://www.toofr.com/some/path/here gets forwarded to https://www.findemails.com/some/path/here. Instead of just forwarding to the homepage, it gets the path too. A much better user experience! Once the Inlistio Salesforce app is updated I'm going to put a redirect app up for Inlistio.com too. If I do it now, the Salesforce app will break. I'm hoping this change will ultimately lead to more direct and organic traffic. Direct traffic will increase because this domain is easier for people to share and remember. "Oh, you need to track your customers' job changes? Just go to TrackJobChanges.com." Easy, right? I also want to own the "track job changes" keyword and having a .com domain with all three words will go a long way toward that goal.